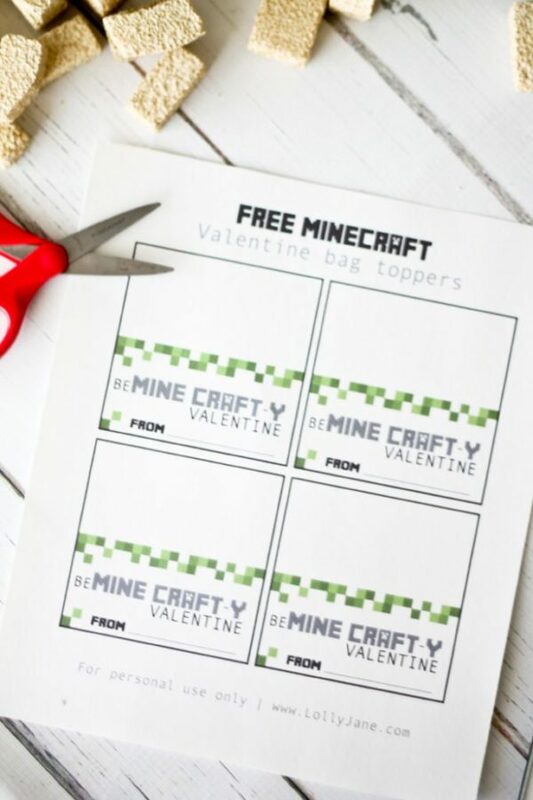 Our sons were complaining how “girlie” Valentine’s Day is so we thought about what our boys love right now and decided on Minecraft Valentines for them to pass out to friends at school. This also scored us mom points because they love to paint & craft- it’s a good keep-them-busy project for sure! 😉 We are a part of the Make It: Fun® team and FloraCraft’s monthly challenge for January was to use cute little project bricks. Since Minecraft is very block-based, bricks were the perfect craft item to pull our theme together! 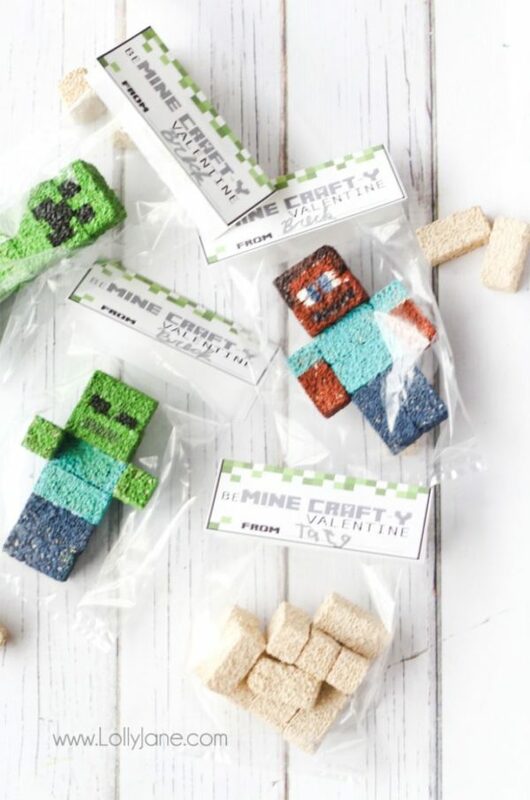 Once they’re painted and dry, secure with Make It: Fun® StyroGlue, slip into a clear Wilton party bag, print our FREE Minecraft Valentine bag toppers and pass out to friends! 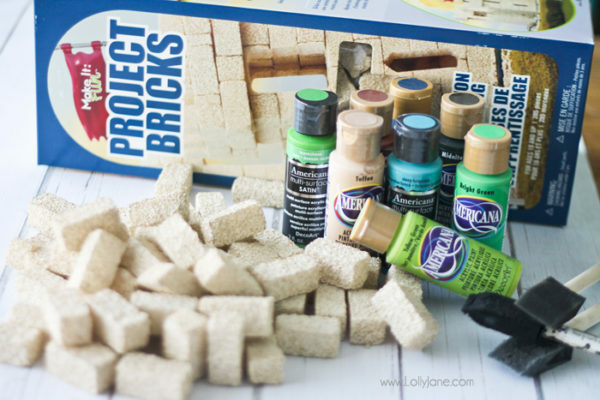 If your kids have huge classes, just toss 10 bricks into a bag and let their classmates DIY on their own! Regardless of what you fill the bag with, these are super fun to make for your littles and are seriously just cute! I love this idea! So clever, and yes, it will keep boys busy for quite some time! Great job. These are so cute! 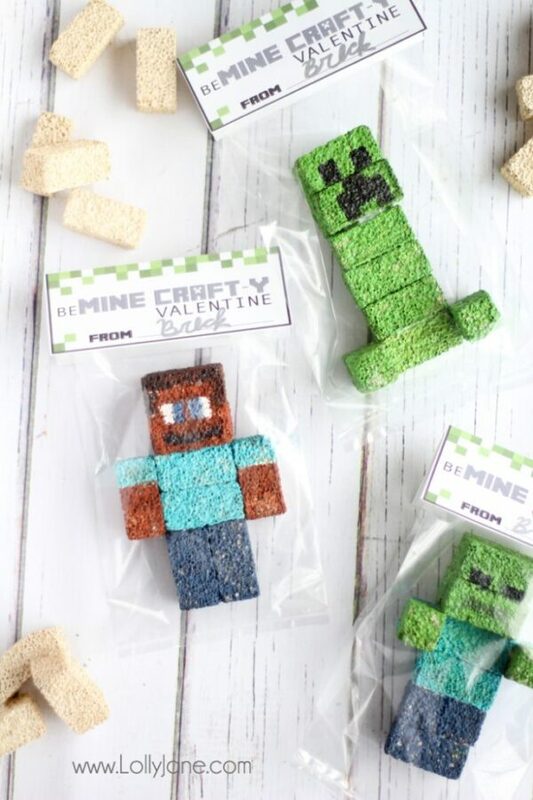 My youngest son is a huge Minecraft Fan ~ I know what we’ll be making this week. LOL “OR ..throw in some green n brown m’n’m’s n call it good;)” Hilarious! Thanks sooo much for the printable. Not certain will uses it for kids at school but I know my LO would love them & some neighbours kids! Thanks again lol good stuff! I love it! My boys would love to make these, but I don’t think I would have the patience to oversee 75 of these adorable creations. Thanks girls for another great project! Hey gals, just wanted to say thanks so much for this tute! My son is almost 9 & MC obsessed so I’m stoked to be able to do a fun craft that isn’t candy. I’m not a candy miser I just can’t believe ALL. THE. CANDY. they get. It’s out of control. This is way cooler. Do you have a video tutorial of this project? thank you. hi what is the width of these? my son and i love them!!! We haven’t quite hit the Mine Craft craze yet in my home, but some of my daughter’s classmates have and it’s amazing how they eat, sleep and think Mine Craft! I know that this project would be a huge hit for my daughter’s classmates. Is there a way you could list the Americana colors? I love these things but I’m a stickler for making them look the same! Thank you! Some color suggestions: Toffee, Inchworm, Deep Turquoise, Night Sky, Cocoa Bean, Black Tie, Bright Green.